Let's go on a LIFESIZE prehistoric adventure! 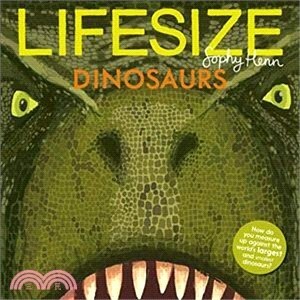 The second interactive non-fiction adventure from bestselling picture book star, Sophy Henn. Step into the book to see how YOU measure up against some of the world's most incredible, ginormous, deadly dinosaurs and prehistoric creatures. This interactive non-fiction adventure features LIFESIZE illustrations so you can try on a Utahraptor's claw, compare your nostrils with a Diplodocus, see how a Stegosaurus plate would look on your back, wear a Pteranodon's beak, and much, much more. And don't forget to open up the fold-out pages to reveal a LIFESIZE Tyrannosaurus rex mouth that's over a metre long! ROAR! This huge, playful book is the perfect introduction to dinosaurs and prehistoric creatures for Jurassic World fans and young dinosaur enthusiasts. Sophy Henn is an award-winning picture book author and illustrator with an MA in Illustration from the University of Brighton. She is the creator of the much-loved Pom Pom series and her book Where Bear? was nominated for the Kate Greenaway Medal and shortlisted for the Waterstones Children’s Book Prize. Sophy was the World Book Day Illustrator in 2015 and 2016.